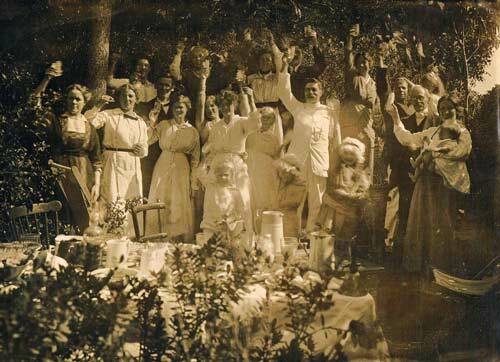 On Christmas Day 1915, the large, complicated extended family of Jennie and Will Lovell-Smith gathered in the garden of their home 'Westcote' to toast their absent son Colin and others in the armed services. Jennie and Will are in the centre of the photograph – Will in a dashing white suit with Jennie on his right. Around them are their adult sons and daughters, their sons' wives, their grandchildren and Will's brother, Mac. In the back row (second from the left) is Kate Sheppard, 'Auntie Kate', who lived with Jennie and Will from 1904, a few years after her husband, Walter, returned to England. On Auntie Kate's left is Winnie, one of Jennie and Will's five unmarried daughters. She was the family's housekeeper and her mother's companion. Kate Sheppard's close friendship with Will Lovell-Smith was the source of some controversy. In 1925, after Jennie's death, Will Lovell-Smith (72) and Kate Sheppard (77) married. Will and Jennie's daughters cared for Will and Kate until their deaths in 1928 and 1933.